expertise to your Association’s benefit! 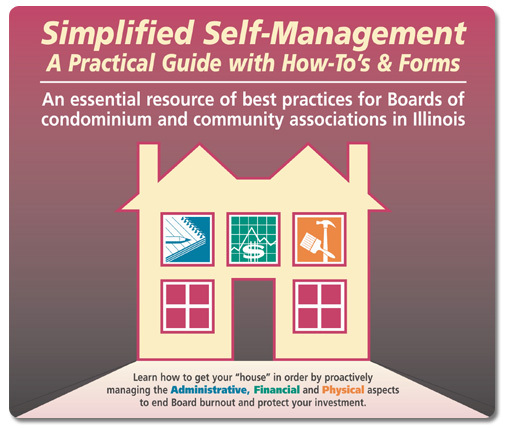 Learn how to proactively manage the Administrative, Financial and Physical aspects to end Board Burnout and protect your Association. © 2010 Association Advocates Inc./Angela Falzone All rights reserved. The key to working smarter and keeping costs down is by standardizing internal processes that are in compliance with condo law and seamlessly transferring that info from Board to Board. Protocols can either be created once correctly or, without guidance, the Board can waste time year after year resulting in legal risk, increased expenses and negatively impacting property values. Increase efficiency & transparency while decreasing liability & time! For more information, usage questions or to purchase SSM System access, please call Shirley Feldmann at 773.348.0742. Copyright 2010 by Association Advocates Inc.